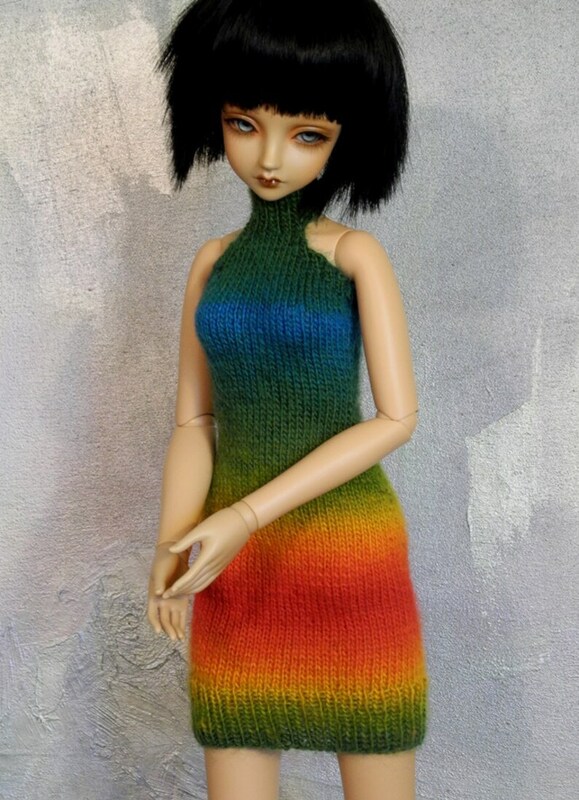 This body-conscious halter-neck dress is handknitted from Schoppel Wolle Zauberball, a brilliant self-striping blend of wool and nylon in a rainbow spectrum of saturated colors. Chromatic slips on, with two hook closures at the back neck and a hem that falls above the knee. I adapted this design from a pattern by Laura Gilkey. Chromatic should fit most slimmer BJD girls in the 50-57cm size range, such as Supia, Luts Delf, Peak's Woods, Zaoll, Dollstown 13, Impldoll Model, and Customhouse, as well as the 22" Tonner American Models. My model (not for sale) is Hattie, a Peak's Woods tan Briana on the original body.